The control (Shewhart) chart is a statistical tool used to distinguish between variation in a measure due to common causes and special causes. 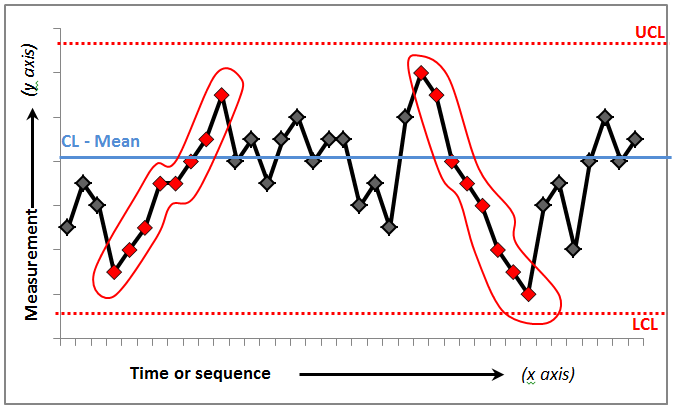 A run charts is a powerful tool for detecting non-random variation but they are not sensitive in detecting special causes. Hence they are used in the early stages of an improvement project. Once more data is available, control charts are much preferred. Control charts are commonly referred to as Shewhart charts, name after Walter Shewhart who did early work in industry to develop this method. Commons Causes – those causes that are inherent in the system (process or product) over time, affect everyone working in the system, and affect all outcomes of the system. Special Causes – those causes that are not part of the system (process or product) but arise because of specific circumstances. 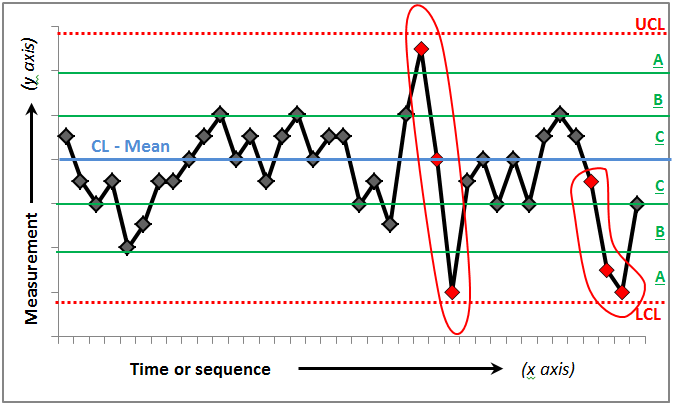 Once the data points are connected you put a centre line (CL) between the graph. For a control chart the CL is called the Mean. The mean is calculated by taking all the values and dividing by the number of values (also known as the average). Control charts also contain control limits. You have an upper control limit (UCL) and a lower control limit (LCL). The control limits define the boundaries of expected common cause (random) variation around the mean. The upper and lower control limits are classically known as sigma limits. 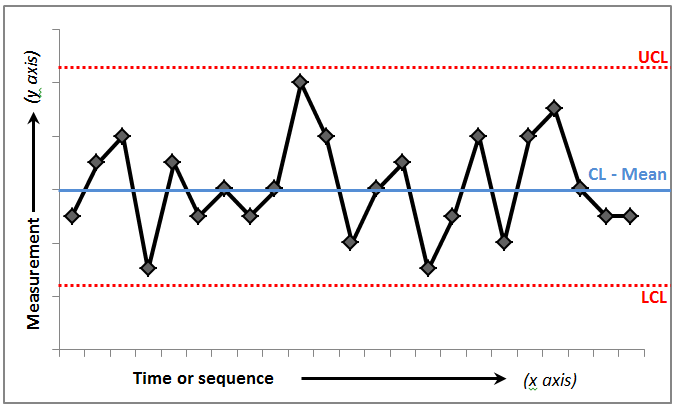 Another variation of a control chart to a run chart is the number of data points required. 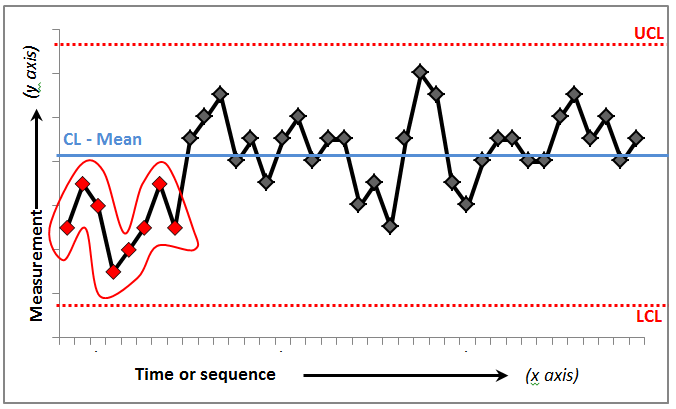 Typically a control chart needs around 15 data points (preferably 20) whereas a run chart can be made using a minimum of 10 data points. The reason being is the mean is more sensitive to point to point variation. Unlike a run chart, there are different types of control charts. Depending on the type of data you have – attributes (classification or counts) or variable (continuous); – and the purpose of analysis, different types of control charts should be used. Classification Attributes are recorded in one of two categories or classes. For example, complete/incomplete, pass/fail or good/bad. Counts Attributes that occur are unusual or undesirable. For example, number of mistakes, number of accidents, or number of no-shows. Continuous Data counted to obtain the volume or amount of a particular entity, typical workload or productivity. For example, the number of visits to a clinic or the volume of lab tests completed. The Shewhart chart provides a basis for taking action to improve a process (or system). 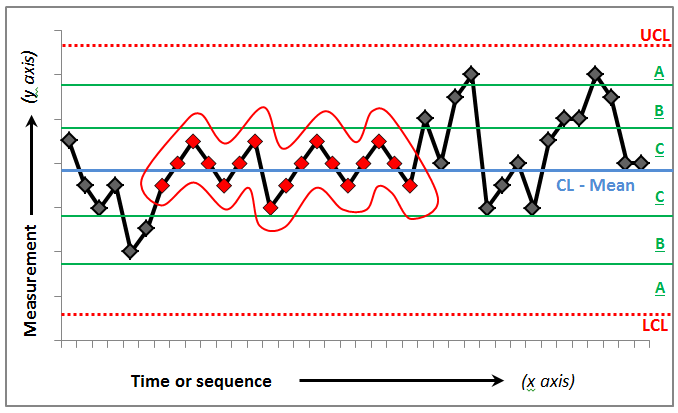 A process is considered to be stable when there is random distribution of the plotted points within the limits. For a stable process, action should be directed at identifying the important causes of variation common to all the points. If the distribution (or pattern) of points is not random, the process is considered to be unstable and action should be taken to learn about the special causes of variation. Most software will name these limits as C, B and A starting from the centre line. So for the limits above the centre line, the first limit will be called C the next will be called B and the next will be called A (working upwards). Use the same technique for limits below the centre line working downwards. Now that we have these zones we can apply the ‘test for special causes’. This is being able to look at the data and ask “do I have special causes?” or “do I have random common cause variation?”. Typically data that vacillate between the upper and lower control limits is common cause variation. But there are ways to detect if you have special patterns in the data. Please note: Limits A, B and C are not shown in rule 1,2 or 3 as they are not used. These “zones” are only used in rule 4 and 5. When you have a data point that exceeds the UCL/LCL, that a demonstration of a special cause. That is data that has exceeded the upper estimation of variation of the process by the UCL/LCL. 8 or more data points hanging above or below the centre line is a demonstration of a shift. Six or more consecutive points all going up or all going down. 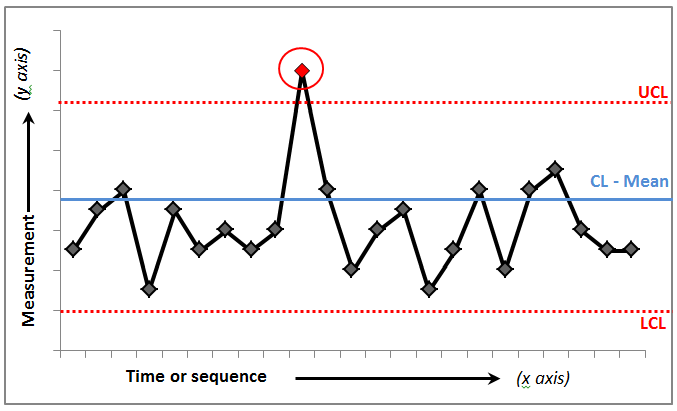 If the value of two or more successive points is the same (repeats), ignore the like points when counting. Please note: When Shewhart charts have varying limits (due to varying number of measurements within subgroups), Rule 3 should be used with caution. Theoretically, it is not correct but it still gives useful information in practice. This rule relates to how the data relay themselves within zones A, B and C. When you get two out of three consecutive points in zone A (outer one-third of chart), that’s an indication of a special cause. Note: When there is not a lower or upper limit on one side of the centre line (for example, on a standard deviation chart with fewer than six measures in a subgroup or on a P chart with 100% as a possible result for the process), Rules 1 and 4 DO NOT apply to the side missing the limit. 15 or more data points hugging the centre line (between zones C). In a normal distribution, you should have around 60% of the data near the mean of the distribution (+/- 1 standard deviation). When you get a pattern like this, you’re exceeding the 68%. What does each rule tell us? Rule 1 quickly identifies sudden changes in the measure. Rule 2 identifies small, sustained changes (like small improvement to a process). Rule 3 detects a small, consistent drift in a process (trend). Rule 4 adds additional sensitivity to detect changes that have not yet triggered Rule 1 or Rule 2. The formula to calcualte the control limits differ for each type of control chart so producing control charts requires specialist software (i.e. QI Charts for excel).